Hydrea London Lymphatic Detox Massage Brush with Natural Bristles is a high quality massage brush, combining flexible rubber nodules and natural bristle over a wide surface area. This brush combines rubber nodules and natural bristles to help stimulate the lymphatic system and encourage the removal of toxins, whilst exfoliating and smoothing the skin. Use in wide circular motions on problem areas to improve circulation and help to reduce `orange-peel` effect. Ideal for preparing the body to cope with detox. Below are reviews of Lymphatic Detox Massage Brush with Natural Bristles by bodykind customers. If you have tried this product we'd love to hear what you think so please leave a review. 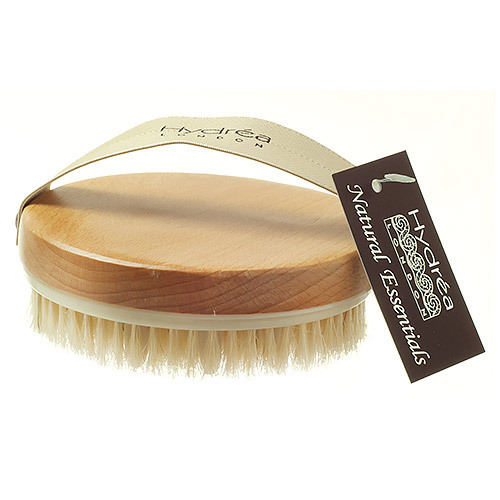 Hydrea London Lymphatic Detox Massage Brush with Natural Bristles is a high quality massage brush, combining flexible rubber nodules and natural bristles over a wide surface area.